I have often thought I could write another book simply exploring the exotic correspondence I have received over the last few years concerning my book on the island provinces of Papua New Guinea called Beyond the Coral Sea : Travels in the Old Empires of the South-West Pacific. I had a number of rather primitive hand-written letters from a lady who had been possessed by 'a bird of prey' - a spirit possession facilitated by a malicious relative. She would awake each morning with deep scratches all over her body, her sleep disturbed by the fluttering of wings. Did I know a 'witch doctor' in Papua New Guinea who could arrange an exorcism by email? I referred her to sorcerer I know in Port Moresby who managed to extort some money but failed miserably to exorcise the spirit of the bird by electronic means. Correspondence ceased shortly afterwards. I wrote a great deal about past cannibalism in PNG in my book as I wished to present the activity in an anthropological rather than sensationalist manner. The distinct island cultures of Melanesia had substantially different ways of approaching the activity. I read recently with interest in the English papers a rather sensationalist account that 29 people were arrested in Papua New Guinea and charged with the murder of seven sorcerers. 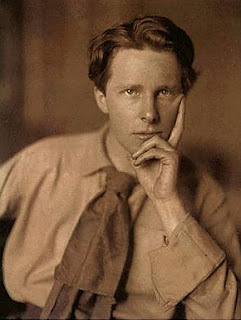 They were alleged to have eaten body parts (it has been asserted that the brains were eaten raw and the penises made into soup). This would enable them to absorb the metaphysical power of puripuri (the practice of 'black magic' sorcery and still much feared) thus rendering themselves invincible to bullets. This belief in the absorption of the powers of the consumed victim explained much past cannibal activity in Papua New Guinea. But this is only one explanation - it is a complex and tendentious subject. Rarely were people eaten simply for nutrition. 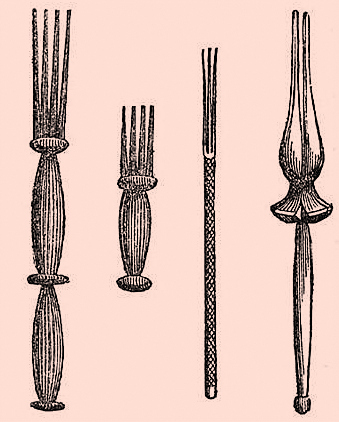 Cannibalism has been illegal in PNG since the 1950s. On my great voyage through the islands I found the country deeply Christian in the main. I grew very tired and resentful of ignorant readers asking me about this unpleasant and generally anachronistic and gruesome subject - as modern Papua New Guineans do too! The Polish anthropologist Bronisław Malinowski in his introduction to the book The Savage Hits Back by Professor Julius Lips recounts an amusing anecdote which perfectly illustrates the paradoxes of cannibalism. The Samoan girls have extraordinarily beautiful bodies, and walk like goddesses. They're a lovely brown colour, without any black Melanesian admixture; their necks and shoulders would be the wild envy of any European beauty. In Fiji Brooke was fascinated by the wildness and forbidding nature of the landscape and the ‘more macabre’ aspects of cannibalism, which had only ceased a mere twenty years before his visit (he wrote an extraordinary letter containing a morbidly amusing cannibal poem and reflections on the anthropophagi to Violet Asquith). 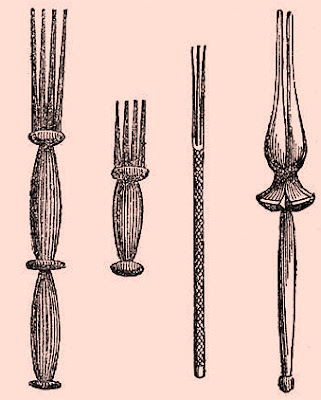 Certainly historically in Fiji there were different implements specialised in shape and design for the consumption of the various human organs. Fiji was a British Colony at this time with some 60,000 Indian indentured labourers (‘Hindoos’ to him) and filled with English individuals of extraordinary eccentricity. 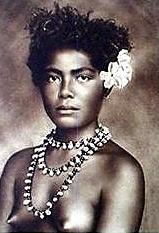 Brooke attended the funeral festivities of a Fijian princess on a neighbouring island, travelling in a canoe with the corpse. He engaged in reckless diving competitions from high rocks with local youths and marvelled at their strength as they carried him across raging torrents. Yes, there were compelling reasons I too loved the South Seas in my youth! Then there was there email from a climber in an ice cave half-way up Mount Everest who thanked me for keeping him warm with my tropical descriptions. Many emails were from yachties but one in particular sticks in my mind. He had been in fear of his life in a storm in the Trobriand Islands but had my book to hand. In it I mentioned that the Trobriand Island captain of a catamaran I sailed on told me of an inlet 'safe in all weathers'. 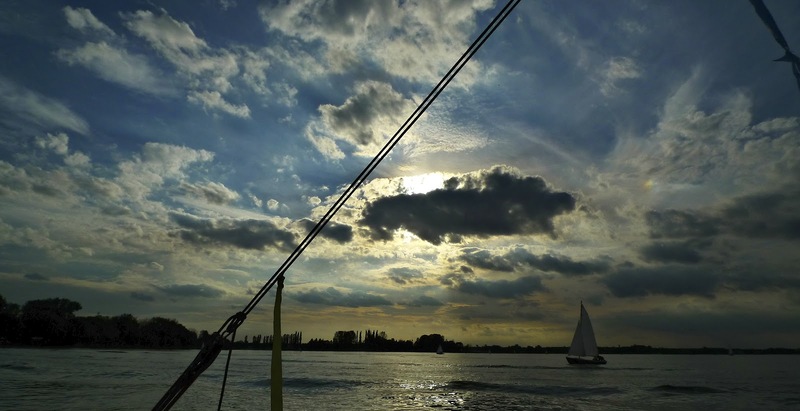 This yachtie followed this advice and he and his crew were saved from perishing in a storm. 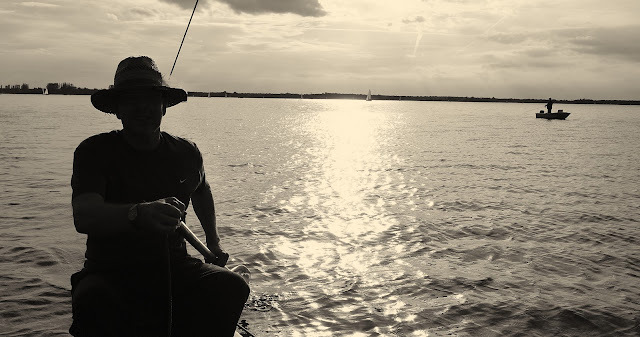 Recently I received an email from a sailor in Warsaw of all places. He had carefully read and been inspired by the Polish ethnologist Bronislaw Malinowski's wonderful book entitled Argonauts of the Western Pacific but also mine. I was most flattered to be placed in this august company. Poles are not generally thought of as having a significant maritime history but this is an oversight. Joseph Conrad springs to mind of course and the former shipyards of Gdansk and the still great port of Gdynia. Since the Second World War and the massive extension of her seaboard frontier, Poland has effectively become a Baltic nation. The Poles are passionate about sailing on the many beautiful lakes in this country particularly in the Mazurian District - my own Arcadia written about in a previous post. 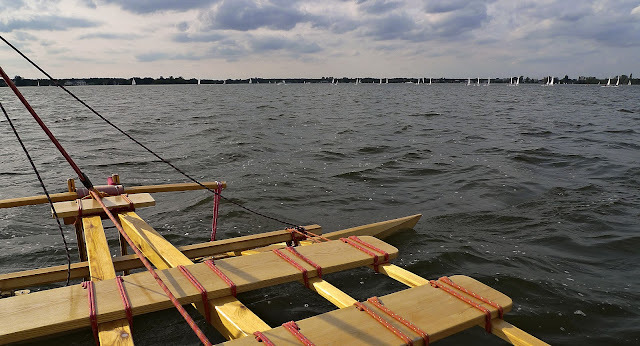 This chap (an aeronautical engineer) sent me a picture of a proa or Melanesian canoe that he had built and invited me to sail on Jezioro Zegrzynskie (Lake Zegrzyński) just north of Warsaw. The spirit of that great Polish genius Malinowski lives! How could I refuse? 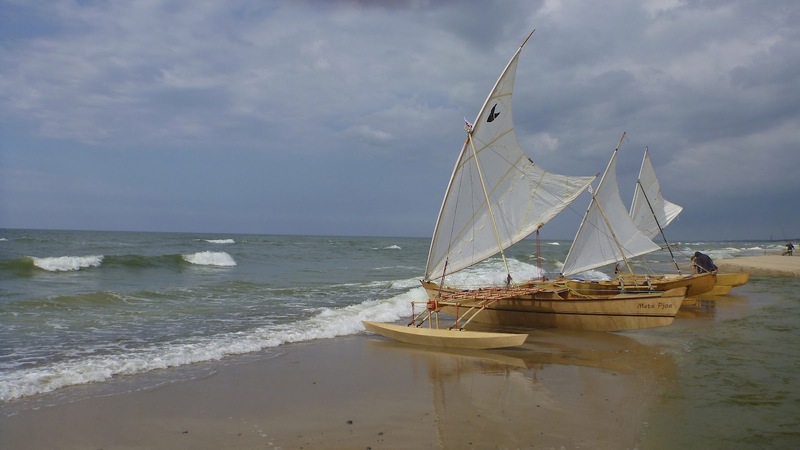 Such hand-built wooden canoes with 'crab-claw' sails are rarely seen now in Papua New Guinea itself having given way to the ubiquitous 'banana boats' with outboard motors. They ply the rivers and coast like buzzing water insects. I jumped at the chance. 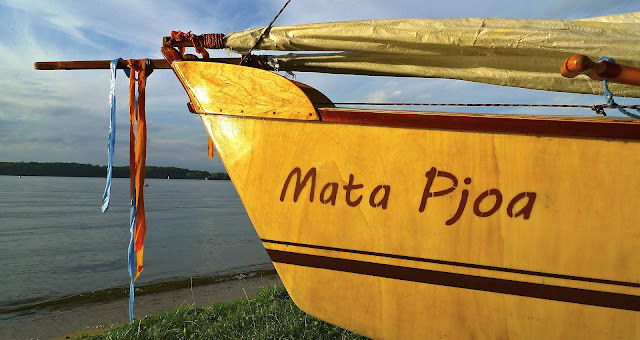 I must say I found it deeply ironical that my first sailing experience in a native Melanesian canoe would take place on a lake just outside Warsaw in Poland. Wonders never cease! There are half a dozen such canoes in the country and they sail both on the lakes and the Baltic Sea. The weather was perfect and many small yachts were skimming the surface. It was still warm although early autumn was beginning to gild the deciduous trees along the shore. We flew rather than sailed across the surface at times and then at others drifted in absolute silence with no apparent forward movement. 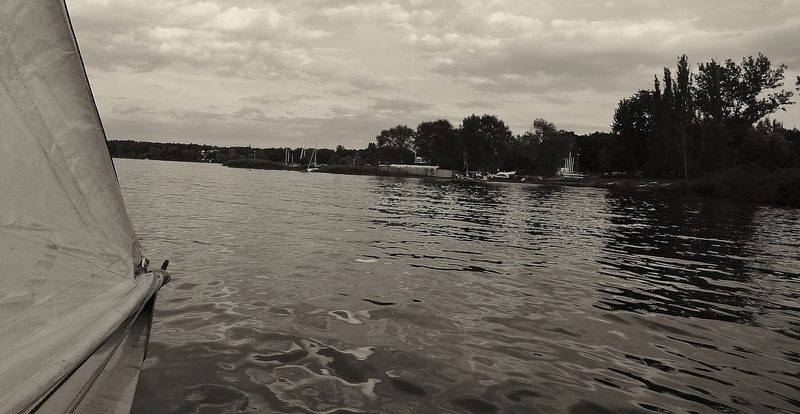 I leave you with some pictures I took on Lake Zegrzyński during this wonderful moment of nostalgia and the conclusion of the Polish sailing season.